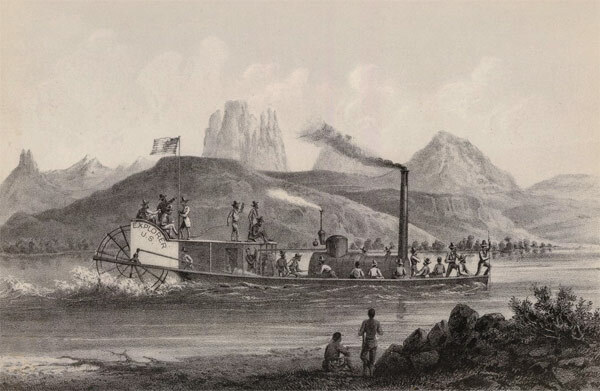 While E. F. Beale was building his wagon road across northern Arizona, the United States army organized an expedition to investigate the navigability of the Colorado River for possible use as a transportation corridor into California, Utah, and New Mexico, which then included Arizona. 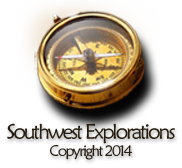 Lieutenant Joseph Christmas Ives, who had been with Whipple’s railroad survey a few years earlier, was selected to command the expedition. Ives hired several experienced men to help him: John S. Newberry, paleobotanist and geologist; Heinrich Baldwin Möllhausen, natural historian and artist and Baron F.W. von Egloffstein, topographer and artist. He had a shallow-draught steamboat constructed and shipped to the mouth of the Colorado River in pieces. The boat, named the Explorer, was assembled in the lower delta and then used to explore the river most of the way to Las Vegas Wash. When the river exploration was complete, Ives sent the boat downriver and converted to pack mules to travel eastward cross-country to the settlements in New Mexico. Along the way, they became the first European Americans to visit the Colorado River at the bottom of the Grand Canyon. They also were the first to follow the Havasupai Trail to the bottom of the canyon. Another first that came out of this expedition was a new style of map drawing invented by Frederick von Egloffstein for the official expedition maps. Instead of tediously-drawn hachures to show terrain relief features, Egloffstein used a shaded relief style, which is still preferred for modern maps. He also had to invent and patent a usable halftone printing process in order to successfully print his new continuous tone maps.